eFlow is a new startup company that started in 2015 specialized in licensing and consulting firm based on its new patented equations and economic models about logistic and strategic finance. eFlow is a new innovative discovery in economic science that is composed of a series of scientific mathematical equations and its derivatives officially called the “Equilibrium Flow Between Economic Systems” (aka “eFlow”). Its diversified applications are related to economics, eco-politics, banking, real estate, healthcare and etc. eFlow can dynamically participate at all levels from micro to macroeconomics. Proper utilizations and applications of eFlow can build a commonwealth of an individual, family, company, corporation, government, educational institution and etc. eFlow unprecedented revolutions are simplicity, direct observation and easy to understand. It is also a universal mathematical language instead of abstract literature. 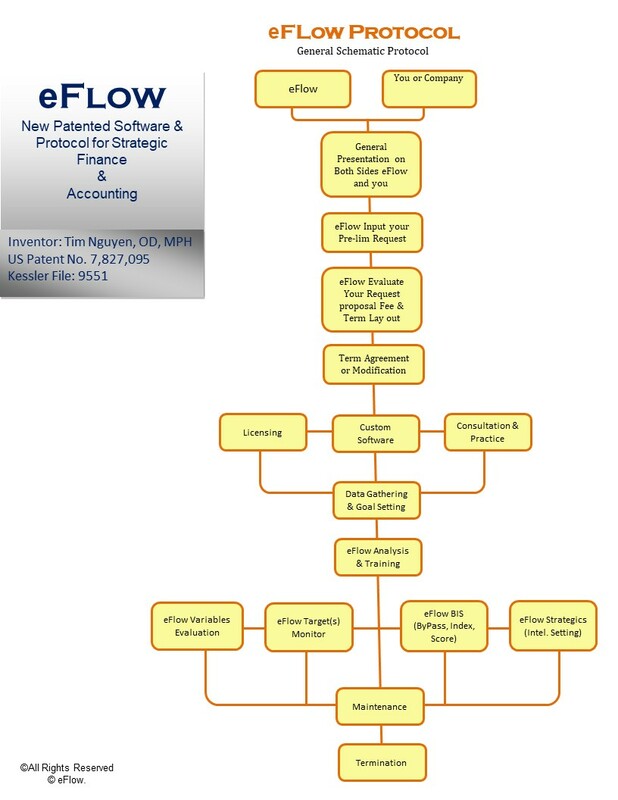 eFlow provides new equations that tremendously helps you see your finance and management like you never seen before. eFlow is patented. This means you cannot find it anywhere else. eFlow is fast, simple and easy to monitor with unprecedented new ways of strategic finance. eFlow focus on what we do and optimize our patented equations capability to help you achieve your goal(s). The language is based on our discovery from the eFlow equations, concepts and its dynamically diversified capability. Some of our common terms can be known as eFlow, eFlow Index, eFlow Score, eFlow Report, Bypass model and etc. eFlow products are dynamically diversified due to its universally mathematical equations. Our products represent a variety of specialties such as healthcare, accounting, eco-politics, etc. The services are licensing, consulting and software.